Advance Keylogger Software is equipped with latest feature that lets you know the activities taking place on your PC behind you. Application simply records overall system activities and internet history details along with the facility to capture Windows screenshots at regular time intervals. Utility logs overall PC activities in an encrypted log file with the option to mail it at pre-specified email address. Features of software allow home users or professionals to records entire PC activities, system sounds, clipboard activities, voice chat conversation, accessed websites, typed URLs and other PC activities in the hidden way. Advance keylogger secretly delivers report of all recorded activities at pre-specified mail id even when you are not physically present with your system. Completely invisible tool does not appear in the system Start up, Task Manger, Programs folders and even remains undetected in the installation path folder. Application has been developed keeping in mind all the users from novice users to the experienced professionals. With the help of stealth keylogger program you can record everything that external users, your Kids, office members (employees) are performing on your PC. Software is the perfect real time monitoring utility for the concerned parents or worried management people who what to know all online and offline PC activities performed on system secretly. • Secretly monitors overall system and internet activities in easy way. 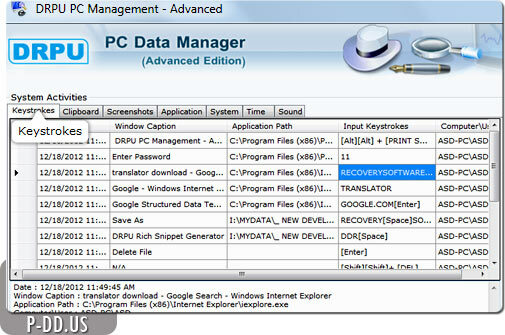 • Lets you detect which applications were accessed recently and what was typed on your PC. • Captures windows screenshots just like a surveillance camera. • Records all clipboard activities performed. • Helpful to provide details of system startup time. • Easily notifies administrator if any modifications were done performed in time settings. • Simple tool maintains all recorded details in log file. • Utility send/upload log file at specified mail id via Email or FTP Server settings. • Capable to run in standard or hidden mode. • Facilitate to set hot keys or run command to access the application if it is running in hidden mode. • Allows easy report generation of all recorded activities in .txt or .html file format. • Secure and password protected application prevents unauthorized user access to change or modify software configuration settings. • Facilitates to keep backup of log files. • Easy-to-use graphical user interfaces along with the technical help manual and intuitive interface.